The guide includes details of drill sites across the region, including five in Surrey (Albury Park, Brockham, Leith Hill, Horse Hill and Bletchingley). It also includes an introduction to acidisation, and Keith’s concerns about a police crackdown on protest. 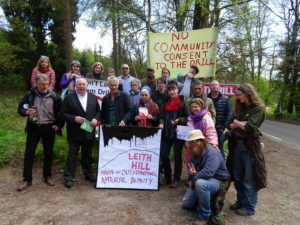 Keith also met with campaigners from Horse Hill, Brockham and Leith Hill, and protectors from the camp at Leith Hill to hear about their experiences and show his support for their work.